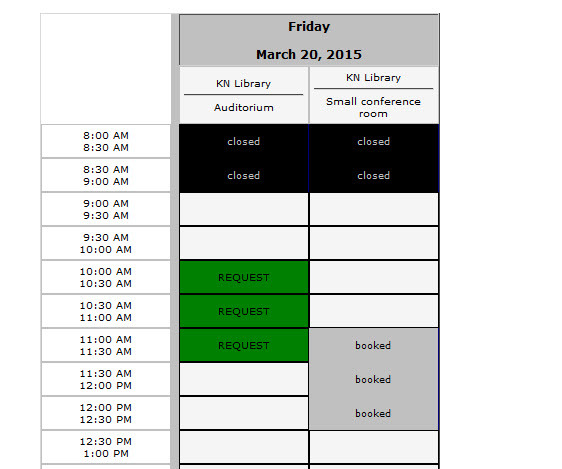 Your library has events, and with those events come the need to schedule meeting rooms and equipment. Why use pen, paper, and notebooks when you can adopt a web solution that works great with EventKeeper? EKRooms makes it easy for patrons to request rooms, equipment, and their preferred meeting time from their home or office computer, any time of day or night. Put your policies online, create multiple configurations per room, allow for set-up and breakdown, and much more. We just streamlined room bookings for patrons and staff with the introduction of EKRooms Matrix Plus. Select a room, date, and time to add to your calendar all in one step.